Three highly-anticipated movies hit theaters this weekend, each looking to take down back-to-back box office winner The Martian. Sony's Goosebumps, Universal's Crimson Peak and DreamWorks' Bridge of Spies debuted on October 16, and, as expected, Goosebumps ended up on top. Box Office Mojo reports that the R.L. Stine adaptation took in an estimated $23.5 million, just barely beating out The Martian, which dropped to second place with $21.5 million in its third frame in theaters. Goosebumps stars Jack Black as beloved author R.L. Stine, whose world is upended when a new neighbor moves into town. Upset about moving from a big city to a small town, teenager Zach Cooper (Dylan Minnette) finds a silver lining when he meets the beautiful girl, Hannah (Odeya Rush), living right next door. But every silver lining has a cloud, and Zach's comes when he learns that Hannah has a mysterious dad who is revealed to be R. L. Stine (Jack Black), the author of the bestselling Goosebumps series. It turns out that there is a reason why Stine is so strange... he is a prisoner of his own imagination! 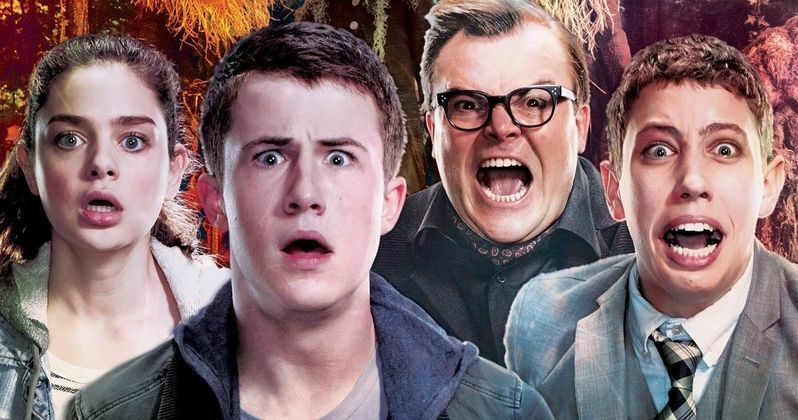 Goosebumps proved to be a hit with critics as well, with a solid 71% "Fresh" rating on Rotten Tomatoes. The family adventure, which also stars Amy Ryan, who also stars in Bridge of Spies, Ken Marino and Jillian Bell, opened in 3,501 theaters, pulling in a decent $6,712 per-screen average in its opening frame. The film opened in 200 fewer theaters than The Martian, which is still faring quite well despite relinquishing its box office crown. The Martian dropped 41.9% this weekend, taking second place with $21.5 million, bringing its domestic total to $143.7 million from a $108 million budget. The sci-fi drama follows the quest to save an astronaut stranded on Mars. We still have a long way to go until the awards season races truly start to heat up, but The Martian has emerged as one of the top front runners. With an all-star cast including Matt Damon, Jessica Chastain, Kristen Wiig, Kate Mara, Sebastian Stan, Sean Bean, Michael Peña, Chiwetel Ejiofor and Jeff Daniels, The Martian should easily crack $200 million domestic before it ends its theatrical run. Bridge of Spies opened in third place with $15.3 million, while Crimson Peak debuted in fourth place with $12.8 million. Bridge of Spies is already a hit with critics, posting an impressive 92% Fresh rating on Rotten Tomatoes, while Crimson Peak pulled a 68% "Fresh" score. Bridge of Spies opened in 2,811 theaters, with a decent per-screen average of $5,471, while Crimson Peak debuted in 2,984 theaters with a $4,306 per-screen average. While these opening weekend numbers aren't incredibly impressive, Bridge of Spies was produced for $40 million, while Crimson Peak had a $55 million budget, so both movies shouldn't have much trouble earning their money back. Hotel Transylvania 2 took fifth place with $12.2 million. The top 10 was rounded out by Pan ($5.8 million, $25.7 million), The Intern ($5.4 million $58.7 million), Sicario ($4.5 million, $34.6 million), new release Woodlawn ($4.1 million) and The Maze Runner: The Scorch Trials ($2.7 million, $75.4 million). Universal's Steve Jobs just barely missed the top 10, taking 11th place with $1.5 million after the biopic expanded from four theaters to 60 this weekend. The highly-anticipated drama had an incredible debut in limited release, earning a phenomenal $521,522 from just four theaters last weekend, with an astounding $130,381 per-screen average. It's mini-expansion proved fruitful as well, with a $25,833 per-screen average. The film expands nationwide next weekend, and we'll surely see it somewhere in the top 10. Opening in limited release this weekend are critically-acclaimed indie dramas Room and Truth, along with The Assassin, Cut Snake, Meadowland and All Things Must Pass. Both Room and Truth pulled in solid numbers this weekend, with Room earning $120,000 from four theaters for an exceptional $30,000 per-screen average, while Truth earned $76,646 in six theaters for a $12,774 per-screen average. While we couldn't find any box office data for Cut Snake and Meadowland, The Assassin earned $48,200 from four theaters with a $12,050 per-screen average, while the documentary All Things Must Pass, the directorial debut of Colin Hanks, earned $20,000 from two theaters. Also opening in a limited theatrical release is Beasts of No Nation, although many analysts weren't sure how the critically-acclaimed drama would fare in theaters, since it was also available for streaming on Netflix. The film didn't perform too well, earning $50,699 from 31 theaters, for a dreadful $1,635 per-screen average. The film was given a limited theatrical release so it could qualify for the Academy Awards, and it's certainly possible this could be an early awards season candidate, given the amount of critical acclaim it has already received. The film stars Idris Elba as an African military leader, who trains a young boy named Agu, played by Abraham Attah in his feature film debut. It will be interesting to see how this film performs while opening in theaters and on Netflix at the same time. Looking ahead, next weekend is shaping up to be one of the busiest at the box office all year, with four new films hitting theaters and Steve Jobs expanding nationwide. Opening on October 23 are Universal's Jem and the Holograms, starring Juliette Lewis, Lionsgate's The Last Witch Hunter, starring Vin Diesel, Paramount's Paranormal Activity: The Ghost Dimension, the final installment in the long-running Paranormal Activity franchise, and Open Road Films' Rock the Kasbah. Debuting in limited release is The Weinstein Company's Burnt, which will expand nationwide on October 30, Attack on Titan: Part 2, Difret, Extraordinary Tales, Heart of a Dog, Suffragette, I Smile Back and Nasty Baby. Take a look at this weekend's box office estimates below, and check back on Tuesday for next weekend's predictions.